Have you ever wondered what it means to do a PhD in Communication Science at University of Amsterdam? Are you interested to take a look “behind the scenes” and learn more from someone who has already done that? 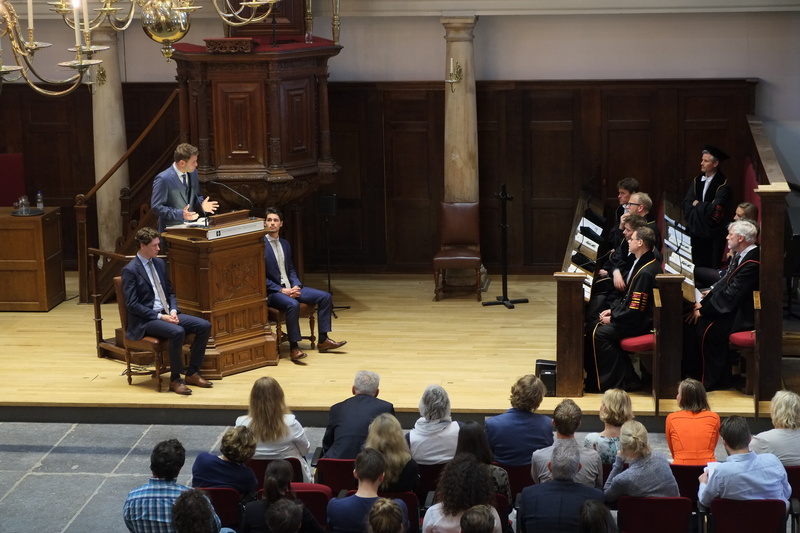 Well, now you have this chance – we present you dr. Boumans who recently defended his dissertation and can tell us more about the challenges of conducting an extensive study and the most fulfilling aspects of being a PhD student. I have been part of the Communication Science at University of Amsterdam during my whole academic education. First, in 2003 I started with my bachelor in communication science, afterwards I did a research master with specialization in political communication. After graduating I worked for two years as junior teacher, again at UvA. Then I decided to write a dissertation proposal which was accepted by the committee. So, in 2013 I started with my research project. Already 13 years at the same department, you can tell that I really like it here. One of the main reasons was my general interest in research. I also appreciate the freedom it gives you to work on something that you personally find interesting. The idea of writing my own proposal and deciding exactly what I would be occupied with for the next few years has definite advantages. What is the process of getting approval for your PhD dissertation? It starts with something like a contest. There is a call for proposals which happens every few years and you have to submit your idea for a PhD topic. Afterwards you go through several rounds of evaluation and eventually your suggestion gets chosen. In my case it was one of only three. I was quite fortunate because there is always some steep competition so you have to be well prepared. It took me a little bit over three and half years. Of course, it depends on the person and the research – you can do it in less time or it can take up to five years. But it is better for you if you manage in three years because after that you are not getting paid (laughs). The subject of my PhD dissertation is two-fold. On the one hand it is about the influence of press releases on news media. On the other hand it also gauges into the impact news agencies have on the news. The method I used was automated content analysis of press releases, news agencies articles and newspapers articles. It can get a bit boring from time to time because you are occupied with the same topic for such a long period. That does not happen very often but it could be a challenge that needs to be acknowledged (laughs). I have enjoyed doing my dissertation because I researched what I find fascinating. When it comes to analyzing the data did you encounter any difficulties? I wanted to develop a new tool for analysis in order to compare texts with automated feature instead of doing it by hand. But I am not that advanced at developing software so it was quite hard to do it. Getting the tool to work was very labor intensive and so was organizing all the data. There were dozens of errors that needed to be sorted out before I could actually start analyzing. So it took me a significant amount of time before using this tool. Tell us more about this tool. A friend of mine programmed it, he is a software engineer. He helped me by writing all scripts and I had to apply it. At the end it allowed me to find automatically to what extent two texts overlap with each other. The next step was exporting the data to SPSS and doing the actual tests of relationship between the variables. What was really interesting is that the majority of online news comes from only one originator. Up to three quarters of all online news that you see on www.nu.nl/ or the sites of de Volkskrant or De Telegraaf, for example, directly comes from het Algemeen Nederlands Persbureau (ANP). There is little to no supplementary information added by the journalists and that is pretty scary in terms of diversity of the news. When you were done with writing up the research you had to defend your study at a special ceremony. Could you tell us a bit more about that? It was a great experience. It took place at the Aula at Oude Lutherse Kerk so the atmosphere was very formal and grand. In addition to my colleagues, my family and friends were there to support me and they were also impressed by the whole environment. The formal procedure of defending the dissertation includes answering questions from the members of the committee, which consisted of five opponents, mostly professors. In my case the questions were not too hard but sometimes they can get tricky. If somebody is contemplating whether to do a PhD what advice would you give them? Talk to people who are already doing PhD or have done it already. This is the best way to get an insight of what it looks like. Personally, I think that this is one of the best working environments that you can be in. ASCoR (Amsterdam School of Communication Research) of which I am part of, is like one big group of friends. It can be pretty tough at times, there is a lot to be done and you have to be hardworking but at the end it is all worth it. Besides, you are autonomous and can decide upon your work-time and the flexibility which is something I appreciate. I feel lucky in this sense and I do not think you can find easily such a nice and friendly atmosphere as the one we have there. Journalists are increasingly blamed for the uncritical recycling of subsidized material in the form of press releases and news agency copy, a practice called churnalism. Boumans employs automated content analyses to offer a rigorous assessment of the relationship between press releases, news agency copy and print and online news in the Dutch context. In contrast to widespread concerns, results show that Dutch print newspapers are by no means churnalism factories, and neither are news agencies. Furthermore, the longitudinal datasets show no increased presence of agency copy or press releases in the print news over the past decennium. For online news, the picture looks radically different: here, the agency is to a great extent steering both the news agenda as well as the literal content of the online news. This dominant role of a single news provider fuels concerns on the level of homogeneity and possible lack of diversity of viewpoints in online news. You can read dr. Boumans’ PhD dissertation online here. In the two years prior to the application of the PhD proposal, Jelle has taught several courses at the College of Communication at the University of Amsterdam, including bachelor seminars on the political economy of media. Jelle’s research master’s thesis dealt with the personalisation of politics and resulted in a book chapter (Brants & Voltmer, 2011) and an article – “Media personalisation in context: a cross-national comparison between the UK and the Netherlands”, (Boumans, Boomgaarden & Vliegenthart, 2013). One of his most recent articles is “Taking stock of the toolkit: an overview of relevant automated content analysis approaches and techniques for digital journalism scholars” (Boumans & Trilling, 2016). Stay tuned for the next edition of PhD Insight where we will present dr. G.L.A. Toni van der Meer and his PhD dissertation on the topic “Communication in times of crisis: the interplay between the organization, news media, and the public”.